What’s better than a sandwich, a grilled sandwich! Here, panini American style, with chipotle chicken, bacon and ranch dressing. Get the recipe from What’s Cooking, Love. An electric panini press, no stove required (photo courtesy Breville). If you have a George Foreman grill, you can grill panini, and vice versa: you can grill fish, meat and vegetables on a panini press. 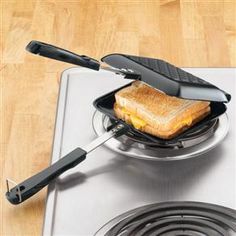 If you don’t want to store a bulkier panini press, a stovetop panini pan stores more easily (photo courtesy Calphalon). Before modern kitchens, sandwich were toasted using a device like this, held over the fire. In your modern kitchen, you can hold it over the flame on your stove (photo courtesy i.Pinimg). August is National Panini Month. It’s also National Sandwich Month. Panini are grilled Italian sandwiches, and panini is Italian for sandwiches. So what gives? Well, you can have celebrate National Sandwich Month with your favorite fillings on bread or toast; or you can grill them on an electric or stovetop panini press. Pretty much any conventional sandwich filling can be grilled. The difference between panini and toasted bread sandwiches is the crispness. Before grilling, panini are brushed with oil or butter, and the heat and pressure of the panini press creates much crisper, crunchier bread. According to Wikipedia, the first U.S. reference to panini dates to 1956. In Italy, the first appeared in a 16th-century Italian cookbook. But it took a few centuries—all the way to the 1970s, to be precise—for the sandwiches became trendy in Italy. In the 1980s, panini crossed the pond, appearing on the menus of fashionable casual restaurants in the U.S. Classic Italian ingredients were offered—prosciutto, mozzarella and arugula, for example. But soon, popular American fillings appeared—ham and swiss, for example. By the way, panini is the plural form of the word, but it’s a compound noun. So whether you’re ordering one or ten, it’s still panini. Panino, the singular, is a roll or a small bread. FOOD TRIVIA: Italians had no word for sandwich. During World War II, when G.I.s in Italy sought sandwiches and asked for meat and cheese on a roll, “panini” became the term. If you don’t have a panini press, you can use an electric countertop grill or a gas grill. Add a fruit or vegetable condiment: caramelized onions, cranberry sauce, diced fruit, fig jam, mango salsa, pickled vegetables, etc. They’re a nice counterpoint to the crunchy bread as well as the fillings. You don’t have to limit yourself to Italian breads like ciabatta and focaccia, delicious as they are. Use what you have on hand. Any sandwich can be grilled, including peanut butter and jelly. Create dessert panini, using fresh or mild aged cheeses (brie, e.g.) with fruit, Nutella, preserves, etc. Brush the surface with butter or oil, to make the bread crunchier. If you don’t want the calories, try butter-flavored cooking spray. Place wet ingredients in the center of the filling. Pat tomato slices dry with a paper towel, for example. You can also coat them in panko breadcrumbs. To keep greens crisp—arugula, lettuce, spinach or watercress, for example—keep them on the side until the sandwich has been grilled. Then, quickly lift up the top and tuck them in. Slice with a chef’s knife (straight edge), not a serrated knife, for a clean cut.